Dark Space 8 – an advanced monitoring station floating serenely among the stars. Its crew – a dedicated and highly-skilled group of professionals, calmly going about their vital work. Its mission – to boldly host the Intergalactic Song Contest. With representatives from myriad worlds competing, the eyes of the universe are on the station. But dark deeds are afoot aboard Dark Space 8… and people are starting to die. The haughty Queen Angvia, the gaseous gestalt Gholos, disposable pop idol Nicky Neumann, erratic Professor Fassbinder and the icily-efficient Dr Helena Harcourt ¬ all are suspects. Could old political rivalries be manifesting themselves among the contestants? Is this the work of a breakaway terrorist faction? Or has someone just got it in for singer-songwriters? With peace in the galaxy hanging by a thread, it’s vital that the mystery is solved ¬ and fast! Can Dark Space 8’s unconventional new commander, with the help of his personal pilot, Mel, find the murderer in time to prevent a major intergalactic war? Or will it be nul points for the entire universe…? As I mentioned in my review for The One Doctor, it’s incredibly rare for Doctor Who to do out-and-out comedy. There are plenty of funny moments scattered through the history of the show, most of them intentional, but they’ve always served as tension breakers for suspenseful moments or dramatic scenes. The One Doctor was Big Finish’s Christmas release for 2001, and saw Colin Baker and Bonnie Langford put on a full-blown panto play for the listening audience that poked a whole lot of fun at all things Who, including the performances of Baker and Langford as the Sixth Doctor and Melanie Bush. Written by Gareth Roberts and Clayton Hickman, it’s an audio that tends to split the fanbase. Some people found it overblown and unnecessary, while others, like myself, find it a hilarious play that’s perfect for the holiday season…though, to be fair, I adjusted my initial review from a 5/5 to a 4/5 after listening to Primeval and Seasons of Fear. My ranking scale is, and always will be, a work in progress. Too bad I don’t have 400 years to calibrate and calculate. 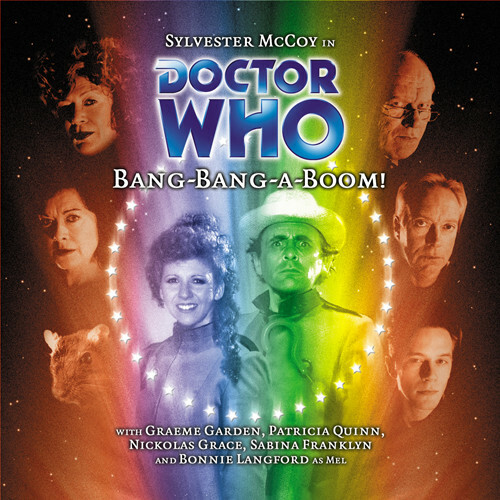 The 2002 Christmas release for Big Finish was another panto piece, this time starring Sylvester McCoy alongside Bonnie Langford and a host of well-known and respected English actors. This time, instead of poking fun at their own house, the writing team of Gareth Roberts and Clayton Hickman take their lampooning to a pair of well-respected science-fiction franchises. While there are plenty of funny moments and fine performances from the cast, Bang-Bang-A-Boom! suffers from trying just a bit too hard, trying to make the jokes just a bit too on the nose, and being just a bit too long with a plot that’s just a bit too scattershot. Welcome to Dark Space 8, a space station hanging in deep space on the edge of nowhere, its technology becoming obsolete and fresher, better trained crews being sent to the more modern space stations. As another space station gets ready to host a treaty negotiation between two warring galactic powers, Dark Space 8 is preparing to host the 309th Intergalactic Song Contest. 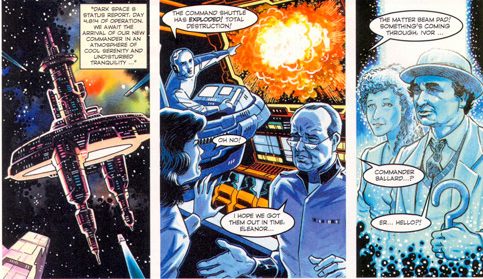 The officers await the arrival of their new commanding officer, but when his shuttle blows up during landing, it’s a miracle that Commander Ballard and his pilot are transported safely onboard. And it is a miracle, as the TARDIS had materialized on that shuttle only moments before, and the Doctor and Mel realized that someone had rigged the shuttle to explode! Stuck on Dark Space 8 until the TARDIS can be recovered from the debris, the Doctor finds himself mistaken for the new commander, and Mel is his dashing, courageous pilot. It’s only supposed to be for a few days…but when one of the contestants is found dead in his apartment, it’s obvious there’s a murderer on board, and it’s up to the Doctor to solve this mystery! But, Mel wonders, is he staying because of the mystery, or because of a sudden and explained attraction to one of the contestants, the vamp-like temptress known as Queen Angyia? The script by Roberts and Hickman and the direction by Nicholas Pegg reminded me a lot of Season 24 of Doctor Who. When I mention Time and the Rani, Paradise Towers, Delta and the Bannerman, and Dragonfire, fans of that era know exactly what I mean. The episodes tended to be very garish, with lots of flashing neon lights, complex-but-nonsensical plots, melodramatic and moody dialogue, overly intense music, and really, really bad special effects, complete with a cheap BBC continuity announcer doing the lead-in for the episodes. The pair of writers, in a good way, manage to echo not only that era of Doctor Who, but also pretty much every other science fiction show from the 70’s, 80’s, and 90’s as well, including the two franchises that Bang-Bang-A-Boom! pokes fun at; Babylon 5 and Star Trek, as well as taking shots at the big Eurovision Song Contest. Every time Mel proclaims, “he’s dead/she’s dead,” it’s accompanied by a music stinger that would be perfectly in place during the 1980’s, and the sweeping theme for Dark Space 8 could have been written by Dennis McCarthy. Throw in the background bleeps, sweeps, and creeps of the station itself and mix in the roaring crowd and general hub-bub of the Intergalactic Song Contest, and it’s like the listener is right there on the space station itself. The story, though…the central plot, as to WHY the murders are taking place and the motivation behind them, is right out of an episode of Star Trek, but the set-up for it drifts and drags along for three episodes before turning into the climax of an Agatha Christie novel for the first half of the fourth episode and then a turn into slapstick comedy for the final segments…although, the gag “ending” with the credits before Mel interrupts is a bit of inspired humor. If I may break out a commonly-used phrase of mine; the script could have used a runthrough with the editor’s scalpel, as there’s a bit of too much time between both the jokes and the moments of tension, along with several subplots that provide some entertainment, but not enough to justify the added running time. Instead, Bang-Bang-A-Boom! wanders, muddling through almost two-and-a-half hours. Not every listener may have the patience to sit through the entire audio and might tap out as soon as the murderer is revealed. Now, since this is the Season 24 Doctor, we get the lighter-hearted buffoon that is the Seventh Doctor. He mixes metaphors, mangles the English language (much to Mel’s exasperation), and generates an exuberance even while dealing with several mysterious death. After his dragging performance in The Genocide Machine and the hollering mess that was The Rapture, McCoy is in high spirits and having a grand time with the role of Commander of Dark Space 8. The misquoting gets a bit annoying a bit quickly, but thankfully (for once) Mel is there to tell him to knock it off. His chemistry with Patricia Quinn in their scenes together are a delight as well, as well as his role in saving the day and hasty retreat, but not before committing one final act of kindness. While McCoy gets a little TOO over the top at times, it’s not in a way that is detrimental to the role. It’s up to Melanie Bush to keep the sanity, which are words NO Whovian ever thought they would see, as the non-screaming sleuth with intergalactic heartthrob Nicky Newman as her assistant. After strong performances in The Fires of Vulcan and The One Doctor, I have one question…you’re going to have an audio revolving around a song contest and you’re not going to let BONNIE LANGFORD sing?!? She was Roxie Hart in the West End performance of Chicago for the love of Rasslion! Here, Mel is regulated to the companion’s role she served in Season 24; being ditzy, cute, trying to keep the Doctor on track, and pointing out the bleeding obvious. But instead of making us want to throttle her, the writers of Bang-Bang-A-Boom! have once again toned down the negative aspects of Melanie Bush and focused on the more positive ones. Her performance here is a bit of a letdown, but that’s not a fair assessment compared to how she knocked the ball out of the park in both of the previously mentioned serials, as Langford still turns in a pretty bang-up job, keeping it understated and low-key and still managing to be a glowing ray of sunshine. The supporting cast…is, well, insane. Patricia Quinn, of Dragonfire fame as well as a little stage musical called The Rocky Horror Picture Show, is the incredibly over-the-top Viking-Queen-pastiche Angvia, turning it all the way up to 12 as she demands the respect royalty deserves. Without giving too much away, the “romantic” scenes with Angvia and the Doctor are a delight, with both actors diving right into the deep end of the pool, as Quinn cries “Rest your head upon my bosom, little man!” On the other side is Gholos, a gestalt creature who speaks a language not even the Doctor has ever been able to translate. Both Gholos and Angvia’s planets have been at war for decades, and while a major peace conference is being held on one of the most advanced space stations in the galaxy, they’re here for the Song Contest to represent their own people. Loozly, played by Nikolas Grace, is Gholos’ translator who haughtily believes the gestalt are superior to all other life forms, even his own. Jane Goddard is Geri, a Pakhar who is serving as the judge for the Song Contest. Goddard plays nervous and high-strung great, but the chittering accent gets overbearing very quickly. Nicky Newman, the fifth most handsome creature in the galaxy, is played by Anthony Spargo, and he does nervous and high-strung well. He quickly become infatuated with Mel because she has no idea who he is and treats him as such, and Langford and Spargo have good chemistry in their scenes together, Langford fulfilling the old companion’s job of “meeting the secondary supporting players so they can get into trouble.” Graeme Garden is a well known comedic actor who plays the station’s science officer, Ivor Fassbinder, while Sabina Franklyn plays Dr. Eleanor Harcourt, the station’s chief medical officer. The pair play their roles completely straight, oblivious to the situation around them, and make constant references to past crisis that Dark Space 8 has experience, such as the Orion Flu or the time Fassbinder had to use technobabble to save the entire galaxy from a star eater. Anyone familiar with Babylon 5 or Star Trek will know exactly where the characters are coming from as their dialogue could have come right out of either show without even a change in punctuation. The truth behind both characters, when its revealed, makes their presence a bit hilarious in hindsight, but also makes their presence make perfect sense. But it comes back to the script. While Logan, played by David Tughan in a great send-up of the Eurovision announcer, hypes up the song contest, in the end, it’s a bit of a letdown, as we only hear a few smattering of songs from all these different alien races. Also, we never get the feeling that Mel and the Doctor are in danger…granted, they are the main characters, and on a show like this, we wouldn’t expect them to get bumped off, but there’s just no sense of urgency to their actions or proceedings. I think what turns the whole thing off a bit for me was that the script seemed a bit mean-spirited. The One Doctor made fun of all things Doctor Who, and the show itself has make a meta-joke from time to time (“Oh, look. Rocks.”). Turning the finger on other shows, which suffered from the same problems as Whohas – low budgets, subpar episodes, cancellation – well, it just isn’t cricket. Eurovision is gently poked at, sure, but it’s science fiction that take the brunt of the punishment, and the sense of superiority from the writers is incredibly evident. While there are moments of grand humor and nods and winks within a decent murder mystery, in the end, Bang-Bang-A-Boom! takes too long to get where it’s going and spends too much time throwing raspberries at its peers. Friendly raspberries, sure, but raspberries nonetheless. Next up – The Doctor is on hand to sort the Daleks out. Defender of the Earth, saviour of us all! With his beautiful assistant, Evelyn Smythe, by his side, he will fight once again to uphold the beliefs of the English Empire. All hail the glorious English Empire! Colin Baker is the Doctor in Jubilee. This entry was posted in Big Finish Review and tagged Big Finish, Doctor Who, Mel, Seventh Doctor, Sylvester McCoy, TARDIS. Bookmark the permalink.